This is a really interesting project and I am hanging out for every post. I nearly cheered out loud when I watched your video of the engine running. Because this is a load bearing structure that will lift all manner of loads over its life (that hook on the bucket looks useful) I think it is well worth thinking through the structure and making it as bomb proof as possible. I wonder if there is a thick walled pipe or tube that could be turned down to fit inside the existing tubing without losing too much strength? That pipe will be in compression when under load with the one inch bar over the top of the web in tension so buckling will be the likely failure mode of the pipe. Making the join under the webbing with an internal sleeve should help prevent that. I think the plug welds will be a good idea also. The other thing that is on my mind is the reduction in cross bracing. The Wagner had a lot of diagonal bracing between the arms and the ford arms lack that. This might end up producing a set of arms which twist more and sway from side to side more. The bracing on your Wagner arms has had a hard life judging by the damage so it must carry some load when in use. Maybe it would be worth replicating the tube between the webbing on the Wagner with new material and diagonally bracing to the ford cross member. As far as length goes how hard would it be to find someone on the web to measure an un modified set of Wagner arms? 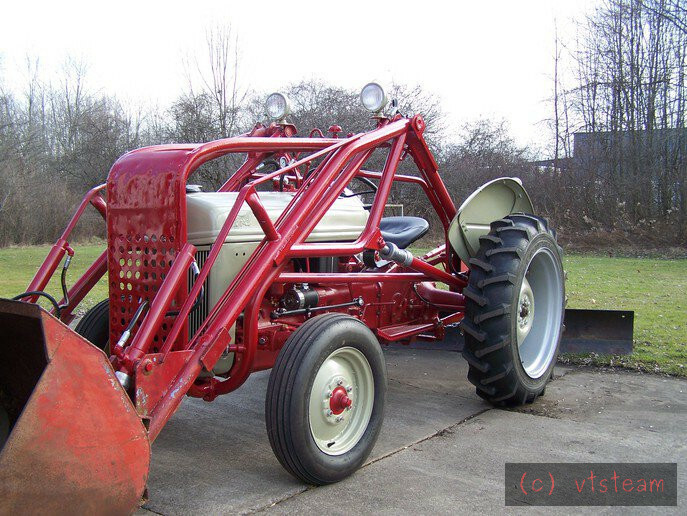 There seems to be a few mentions on various tractor forums with pictures of restored and un modified loaders. Maybe someone will be able to help. I'm looking forward to seeing you pull this together and shift some earth. It's a great project and will be a real asset to you. Thank you all for help and suggestions! You can see the upper tubes have been shortened and the web extensions which were left. Also the round tie rods were left intact. 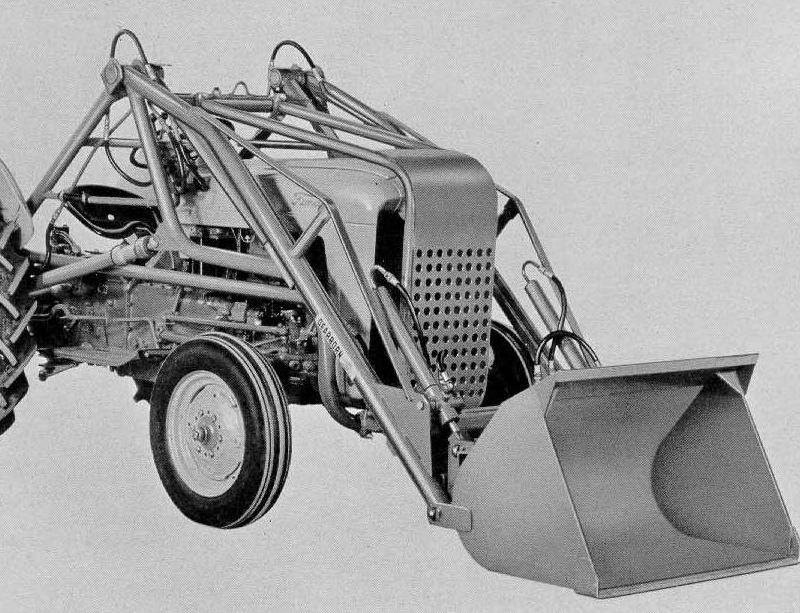 The Ford Dearborn bucket end has a heavy cross tube and gussets for support. It uses dual hydraulic cylinders at each side of the bucket/arm structure. You can see the attach points and gussets for these. 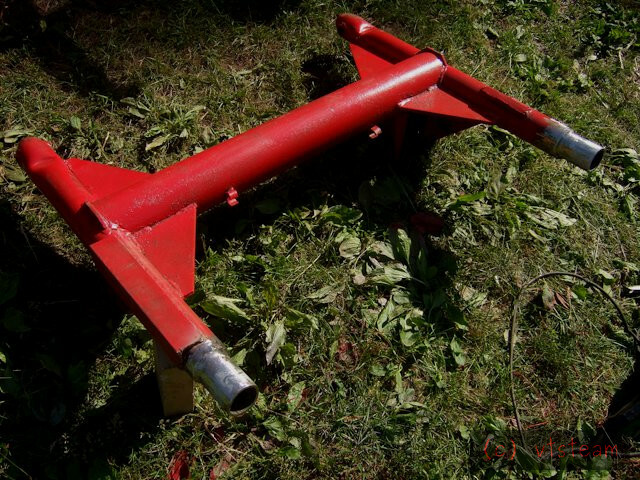 The Wagner arms used a single hydraulic cylinder. 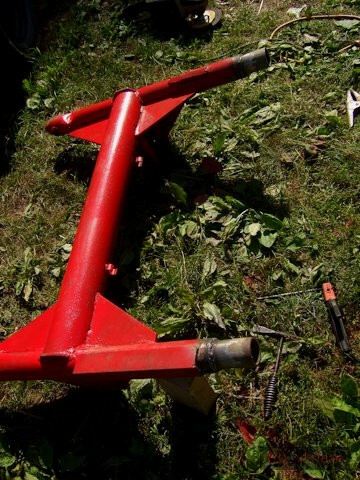 It was attached to a much lighter cross beam higher up on the arms, with diagonal tube supports. It was this whole hydraulic support structure that didn't fare well over time -- the pressures are enormous, and applied between the arms. I think the Ford design is better. It localizes the pressure and doesn't try to break the arms apart or put big bending stresses on the cross beam. I think that is why it lasted better. Nevertheless there was some repair sistering of the lower tube with angle iron -- you can see it here. Stresses over time flex and fatigue these transition areas where gussets stop. Modern arms are built differently -- usually rectangular section and tapered to prevent stress points. They also tend to be shorter -- the earliest loader arms look overly long in the old advertisements I've seen -- often loading bales of hay into barn lofts. They weren't considered as much earth moving implements as used for manure shifting and hay lifting. the early fifties saw a shift in function, so these are somewhere in between. 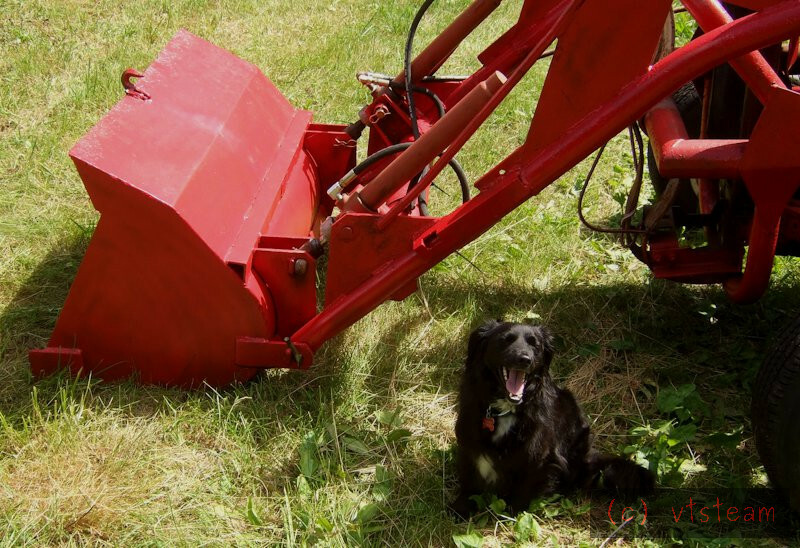 Sorry, couldn't progress with the tractor -- it rained all day. I love this thread as I like to rebuild and tinker with old machinery myself and to be honest i never gave the length and different functions of the old compared to new loaders a thought. 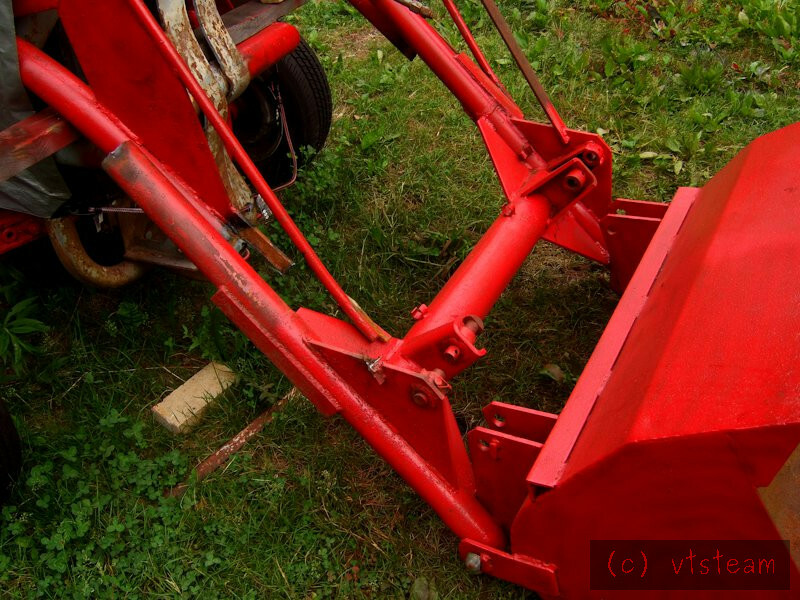 Its great how this unravels the history of farm tractors. Thanks Michael. 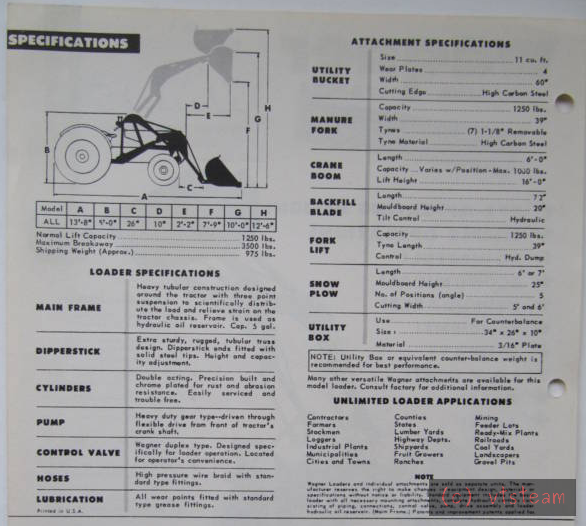 Here is some information I've collected on the Wagner and Ford Dearborn loaders. Wagner frame --- looks like the bucket is quite far forward -- so that helps. It makes total sense to me. Now that I think about it. When I was a kid we used to help putting hay bales in the barn and stack them " by hand" with the help of a pitch fork and some claw hooks. Heck, these day ya could not fit an average bale on the back of a pickup truck ... not even thinking big modern round bales here either. So yes the demands have changed a lot in the last few decades. I guess it has all to do with less people working per acre if that makes sense. Here's the Ford Dearborn. 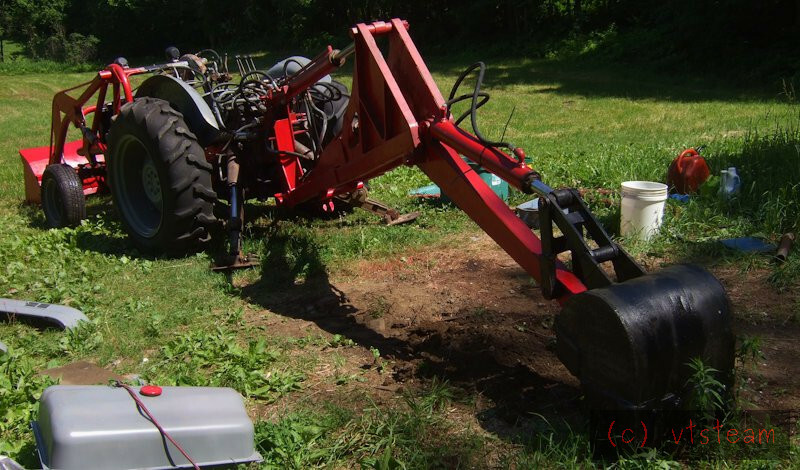 It looks to me like the bucket is at about maximum rear tilt in the ground position -- judging by the hydraulic cylinder extension -- which makes me more comfortable with what I see placing the parts together on the tractor. I guess that's the way they are. Interesting points: notice the double bucket cylinders. Also notice the main arm cylinders go way back to the rear axle. The Wagner cylinders are much further forward -- near the foot pedals and land on an auxiliary pipe frame. 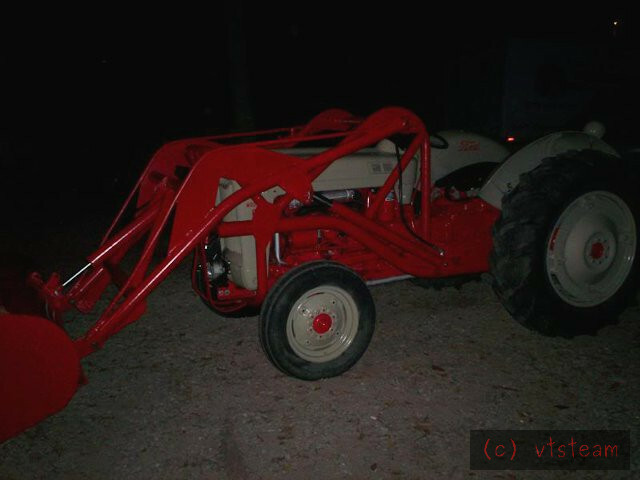 The Ford frame goes way back, making it seem hard to get into the tractor seat. I like the Wagner better here! Wagner loader -- slightly different becaus of the nearly complete infill of the upper tie rods on the arms -- otherwise, a good view of the single cylinder structure and bucket. And the Ford Dearborn style again. Another thing to notice besides the difficult entry is that the frame attaches to the arms with large pins. On the Wagner there is a tube that runs all the way across the frame at that location and the arms attach to a solid axle inside the tube. I like that system better -- it provides more rigidity to the frame and the arms and ties everything together. It's just coincidence that I like the particular features of the odd pieces I received to put together, rather than the other way around. But I may have lucked into the best features of each design. ps. I see there's an angle iron sister piece -- part of a repair -- at the same location on the arm tube, just above the bucket gusset. 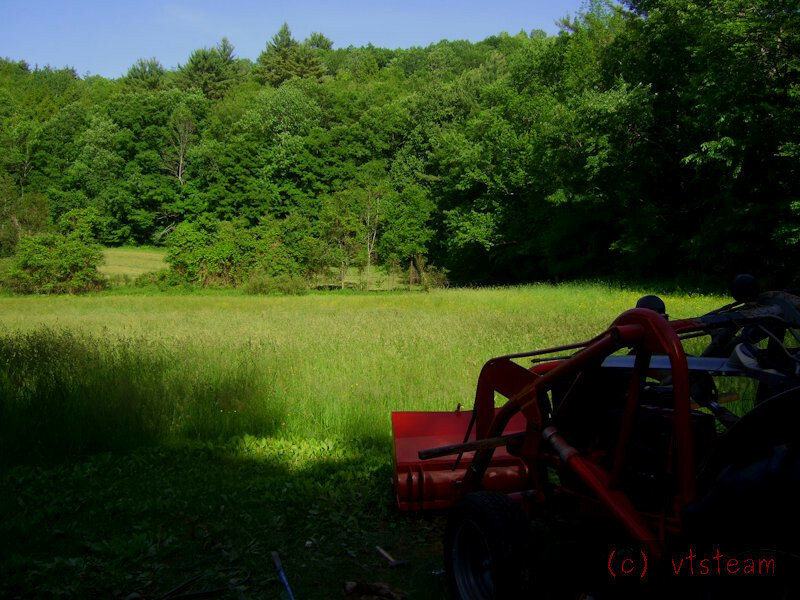 After 4 days of rain, the sun finally began to shine yesterday, but I couldn't do much work on the tractor -- too much mowing to try to catch up. I did get an hour to cut the tubes down to what I hoped was finished length, square them and grind the weld areas clean. Today, Father's Day, I was treated to breakfast by my wife and daughter at the Grange, and then paid a visit to friends at the flying field for an hour. 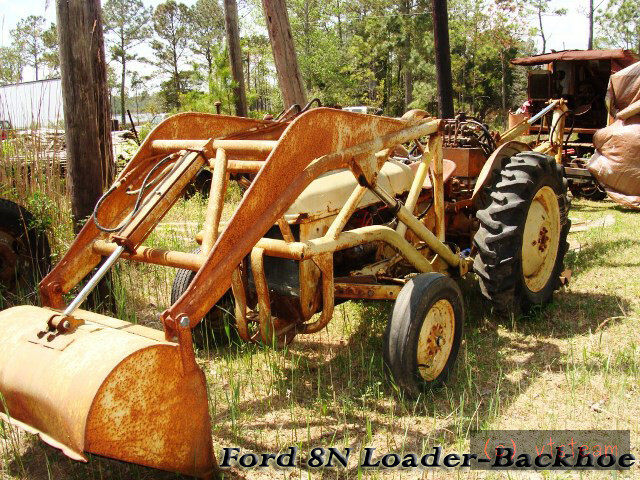 Finally after lunch it was time to get back to the Ford 850 loader project in earnest! 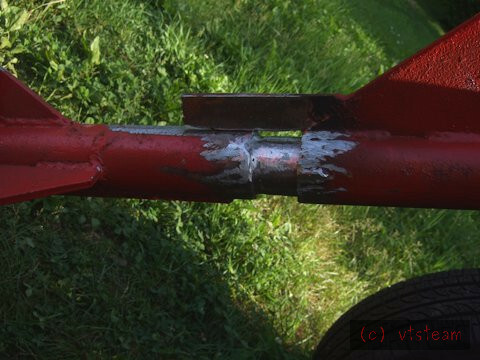 First thing I did was grind off paint on the tie rods near the gusset so I could heat them with less smoke using the oxy-propane torch and bend them up a bit so they wouldn't be in the way. Working alone outside on uneven ground, it was really tough to get the arms aligned so they could slide together. Quite a struggle! The bottom was not only heavy, but unbalanced -- lifting one tube tended to swivel the other. You can see the heated and bent tie rods in this photo -- they would have made fitting the arms even harder if left straight. But finally I got the far tube started. And tacked in place. I couldn't get all the tacks done because the tractor was too far from my welder -- cables barely reached. I managed the last tack only with a brand new stick electrode for extra reach! 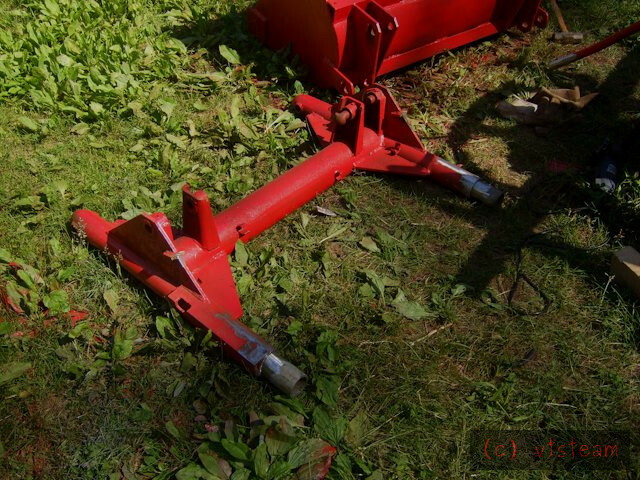 Tomorrow I will replace the tractor ignition, start it and move it back closer to the shed! Good to see the arms finally in place! I don't think it's coincidence. You don't like the weak parts of the design. The weak parts have failed. You're left with the better parts of the design. Well I suppose that's true, Russell. Working on it now, just in for lunch -- got the ignition system rewired with a new solenoid and battery ground strap replaced. The transmission interlock starter switch is now functional. (It had been replaced by a dash mount universal switch, but I restored the stock setup). Found a troubled distributor rotor -- something bad happened to it somewhere along the line -- chipped plastic and the tip bent round! Anyway, fixed. Don't waggle those arms too much while only tacked ! No problem, Andrew, only lifted them four inches off the ground! I spent the entire afternoon welding heating and grinding. Welding is not my forte, and I'm slow at it. Particularly out of position stick welding with a buzz box. I used 6011, which in my hands, isn't pretty. But by the end of the day I think I got good penetration, kept the slag out, and ground back anything I didn't like, and then re-welded. It was a hot day with plenty of deer flies buzzing around, and a bunch of wasps that had tried to start homes in various tractor nooks and didn't like all the noise and smoke. I have to say this kind of thing, though satisfying in the end, isn't my favorite kind of metal work! I wish I was a better welder. I reheated the tie rods and bent them down to the gussets. Just before that I did run into a bit of a puzzle....I was flame cutting off the tie-rod tag ends -- flat bar from the Ford end, when I hit some kind of weld material in a clumpy repair that I couldn't cut with the torch. I'd noticed this stuff before -- kind of shiny, not a typical weld. I don't know what it was. Maybe some kind of stainless or nickel rod? I eventually had to cut it off with the grinder. 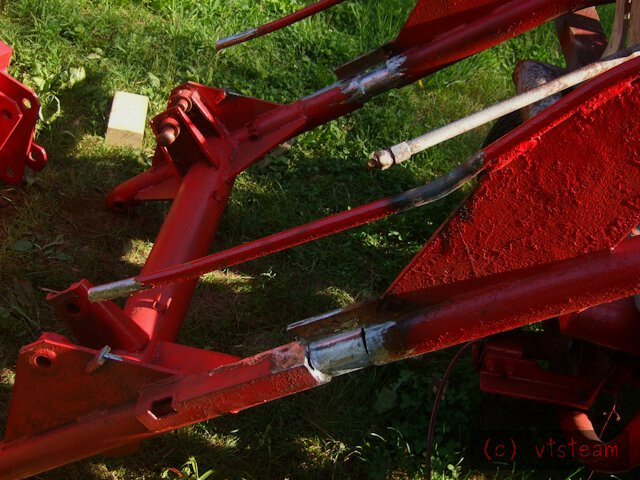 Finally the rods were bent down and welded in place, and I was done for the day. 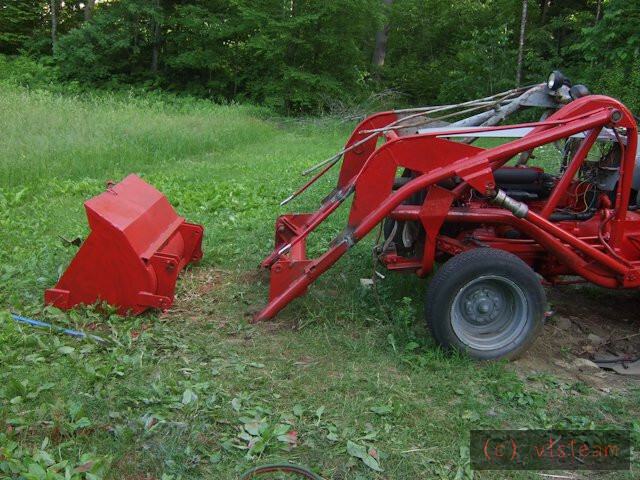 Well, had to do one more thing just to see it -- I shifted the bucket over by hand and shot the pivot pins in to see it all together. It looked good. 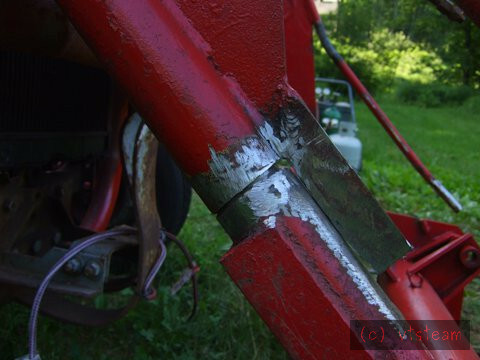 Almost certainly the shiny weld had been made using "dissimilar" rods. Rods containing nickel intended for welding dissimilar metals. Been a bit of a pause while I remodeled the bathroom. But back at it now.